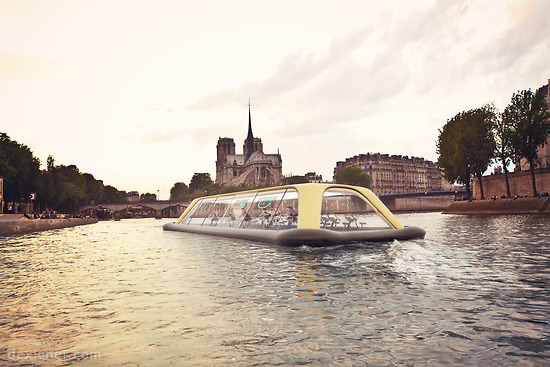 Italian firm Carlo Ratti Associati unveiled designs for the Paris Navigating Gym, a human-powered 66-foot long fitness vessel that can accommodate about 45 individuals. The fitness vessel features Technogym-built ARTIS machines, which take energy produced during workout sessions and convert it into other forms of energy. Thanks to electric propellers, the boat can be used all year long and travel all the way up and down the Seine River. Specifically, the vessel would be open during the summertime and enclosed in a transparent glass covering during the colder months of the year. The transparent glass will also feature augmented reality screens that display real-time information, such as energy sourced from workouts and outdoor weather conditions, while passengers are working out. While the goal is to explore the potential of human energy to power vehicles, the fitness vessel could also be powered by supplementary solar panels.